News: DodgeCharger.com decals are available here! Ok so I want to change out my old brake lines, I have 4 wheel non-power drums on my 69. But on classic industries it has 2 versions for 4 wheel non-power drums type 5 and type 6 can someone tell me the difference. 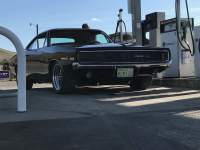 68 Charger R/T, 493 stroker engine, 727 auto. Type 5 goes through the right inner fender, through the splash shield. Type 6 goes under the right frame rail.